The Pearl Izumi P.R.O. AmFIB Super glove uses 170 g Primaloft® Gold insulation with OutDry® waterproof / breathable fabric to ensure dryness and warmth during winter's worst. The half-lobster design combines the insulating properties of a mitten with the superior dexterity of a fingered glove. On the exterior, the P.R.O. Softshell fabric is treated with a durable water-repellant coating, and the palm is constructed from rugged Clarino™ synthetic leather for extended longevity. 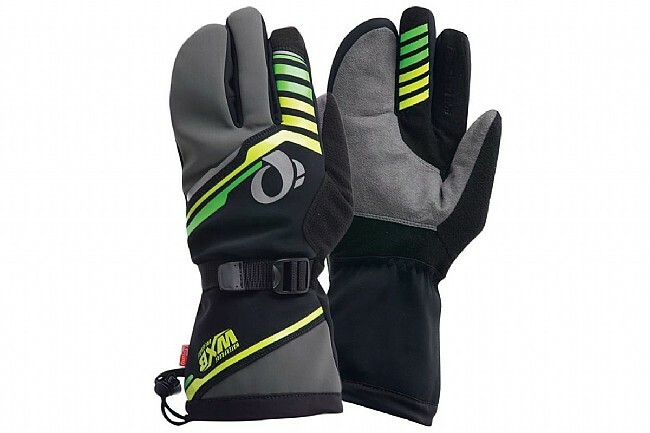 A double-closure system consists of a drawcord at the wrist and a cinch on the back of the hand to securely fasten the glove and seal out the cold and wet.